Treats motor oil to stop smoking, plus fouling and reduce oil burning. Works with all types of motor oil. 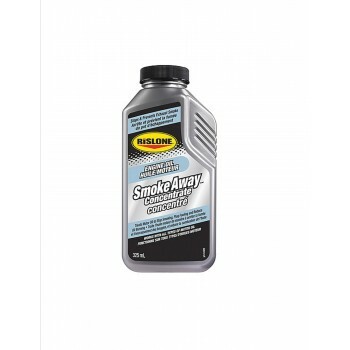 Rislone Engine Oil Smoke Away Concentrated is specially designed to reduce exhaust smoke and help stop oil burning caused by blow-by. Blow-by is usually caused by gaps in internal engine parts resulting from excessive wear. Works with ALL gasoline and diesel engines using conventional, high mileage and synthestic engine oil. 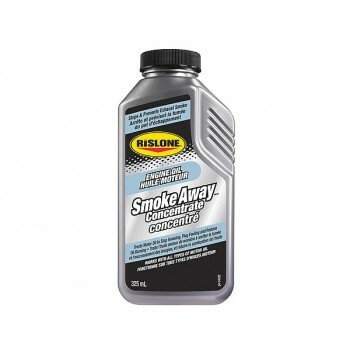 Add entire botttle of Smoke Away to engine oil at or between oil changes. One bottle treats up to 4.5L of oil. If smoke continues, second application may be required or mechanical attention is needed.